We received this book’s cousin, Little Bee, from my sister-in-law, who chose it because it was much beloved by both her girls. She would have passed her copy along, but the bee had been drooled on too many times to count, and board books are not technically machine washable. When I learned there was a whole series, I resolved to get at least one or two more, because my son was gaga over the bee book. 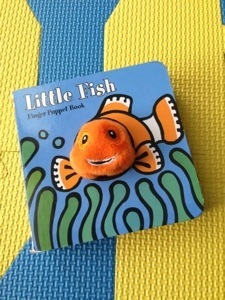 Wiggling the finger puppet holds his attention and gets him to engage with the book. The illustrations are cartoony-simple and full of contrast — again, great for holding the baby’s attention. But what I really like about these books is the writing. I know. Crazy, right? Bear with me. The lines rhyme without being saccharine, there’s a simple storyline (in this case, the fish going to sleep), and the word choices relate to the animal. So Little Fish contains words such as ocean, splash and tails. And the author (there’s none listed on the book) does all of this in only 45 words. As a writer, I find that impressive. 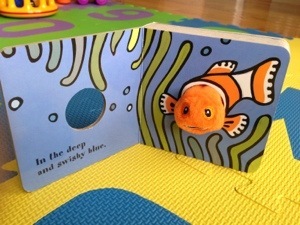 As a mom, I appreciate the effect: A fun reading experience for both of us. In St. Louis, the full line of 21 books (or damn near the full line) is available at the Missouri Botanical Garden’s gift shop. Reading through them is fun, quick, and a great way to make sure you don’t get stuck reading something you don’t like 88 million times. Like the thing about flies in the spider one. Ick.